I have a thing with white. An obsession really. White t-shirts (I think I own about 15), white linens, white pants, white cars, and especially little white dresses. Summer is the only time out of the year that we get 3 months to be carefree and live as we please. 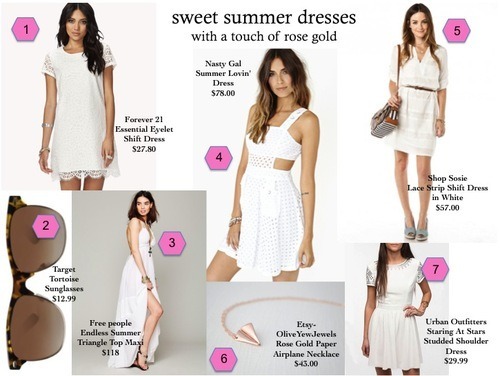 Whether your budget is tight or you can shop at any store you please, there is that perfect sweet little white dress out for you this summer. Slip one on, throw a little black lace bra on underneath, take a deep breath and live summer! ~Kate Hudson-Black is always classic and her hair was simple. Just a stunning look. ~Nicole Richie-looking glamorous in that all beaded baby blue dress. I adore the long sleeves too. Perfect for the unexpected cold weather they had! ~Jennifer Garner- The strapless deep red dress was a perfect fit. Love how she can go from mom to glam in no time! All these ladies are inspiration to fashion. Can’t wait for their next looks. – To prepare the sugared rims, combine sanding sugar, granulated sugar, the scraped seeds of the vanilla bean and the vanilla bean pod in a large bowl and mix. You can do this a few days ahead of time if desired. – Coat the rims of 8 champagne flutes in something sticky and sweet, such as leftover frosting or marshmallow fluff. – To make the cocktails, pour 2 ounces of the coconut juice blend or puree into the bottom of the flute. Fill the remaining space with prosecco and stir with a long spoon to mix. Cheers to this glamourous drink!